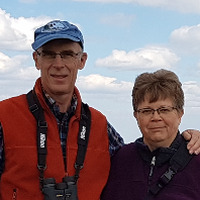 Retired couple who enjoy travelling North America in their 5th wheel. 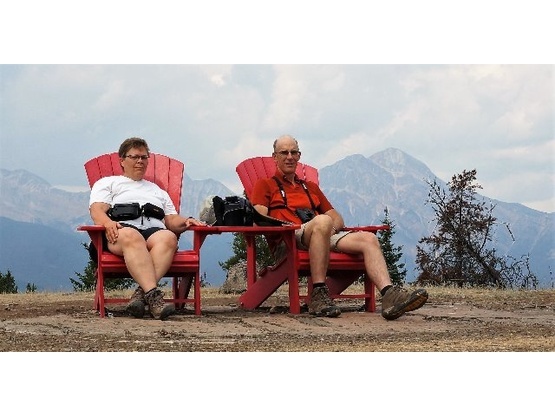 Finding the red chairs in Jasper at the end of our 3 1/2 months to Alaska & the Yukon. Small town parks run by the community can provide some great boondocking locations - unfortunately they can also be lonely! We retired in 2016 and spent the summer of 2017 travelling from Ontario to Alaska and the Yukon for a trip of a lifetime!. We managed to stay at a few boondockers locations on that trip and hope to continue the trend. We've travelled much of Canada & the United States, much of which was done with our daughters as they grew up. We especially like to look for locations where there are rail trails for bicycling. Paul is handy and does most fix-it things around the trailer when needed. Joyce is handy in the kitchen and enjoys crafting. 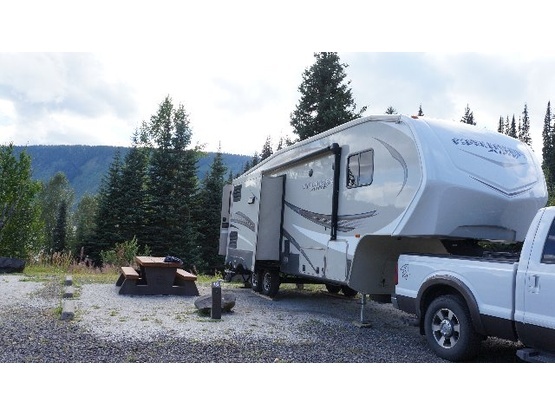 Previously, boondocking has been in Walmart parking lots, sometimes Pilot/Flying J. We're enjoying meeting more people through Boondockers Welcome stays and sharing stories and new ideas of places to see. We live in a small community just west of Kitchener-Waterloo, in Southern Ontario. We finally got the rig we've looked at for a number of years - a 32.5' Grand Design Reflection Fifth Wheel. 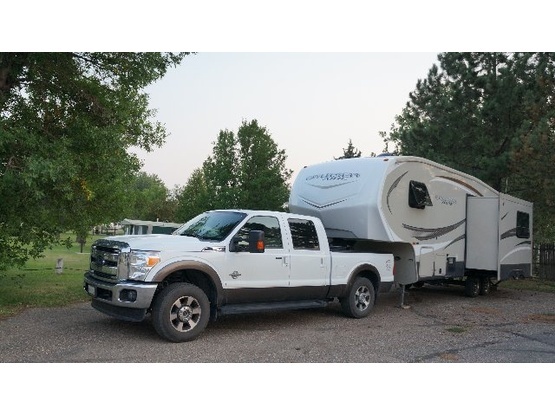 We pull it with our Ford F250 Diesel truck. We sure enjoyed Paul and Joyce and Brad and Brandon. They were delightful guests, and it was fun to see someone travel with grandchildren! We sure couldn't say enough about the creative cards Joyce gave us as a thank-you gift. Wow! You guys are welcome anytime. Spent one night at our place. Good people. Paul & Joyce are a great couple with whom we shared many things in common. Conversation was great. Love to have them visit again and hope our paths cross again sometime. Wonderful people. pjtrekkar gave us a tutorial on fifth wheel trailers and treated us to a rhubarb pie made on the night of their visit. Possibly the best rhubarb pie on the planet. Was. It is gone now. We would welcome them back anytime. Great people to visit with during their travels. Great to talk to P & J while traveling through Minnesota. They are welcome to stop anytime. Very nice folks from Ontario. Enjoyed our conversations, they are welcome anytime we have space.